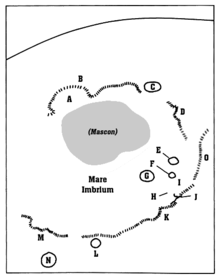 Detail map of Imbrium's features. Sinus Iridum is the feature marked "A". Sinus Iridum (Latin for "Bay of Rainbows") is a plain of basaltic lava that forms a northwestern extension to the Mare Imbrium on Earth's moon. It is surrounded from the northeast to the southwest by the Montes Jura range. The protruding part of the range at the southwest end is named Promontorium Heraclides, while that at the northeast end is called Promontorium Laplace. This bay and the surrounding mountains is considered one of the most beautiful features on the Moon, and is a favorite among lunar observers. Sinus Iridum is formed from the remains of a large impact crater, which was subsequently flooded with basaltic lava, inundating the "sea" wall. The bay itself does not contain any notable impact craters, but does include the satellite crater Heraclides E in the south, Laplace A along the eastern edge, and Bianchini G in the north. The surface is level, but is marked by a number of wrinkle ridges (dorsa). The selenographic coordinates of the bay's center are 45.01° N, 31.67° W, and the diameter is 249 km. It was the planned landing site of Chang'e 3, China's 2013 lunar exploration mission, which instead landed nearby in Mare Imbrium. By convention these features are identified on lunar maps by placing the letter on the side of the crater midpoint that is closest to Promontorium Heraclides. The following satellite craters are associated with the Promontorium Laplace. ^ a b "Gazetteer of Planetary Nomenclature - Sinus Iridum". United States Geological Survey. International Astronomical Union (IAU). 18 October 2010. Retrieved 2018-01-30. Wikimedia Commons has media related to Sinus Iridum. Nemiroff, R.; Bonnell, J., eds. (8 February 2008). "The Bay of Rainbows". Astronomy Picture of the Day. NASA. This page was last edited on 23 February 2019, at 18:27 (UTC).